It all happened around 3:30pm yesterday at Jabi Area of Abuja.. when an unnamed VIO officer started dragging the steering with a taxi driver who was trying to escape arrest. 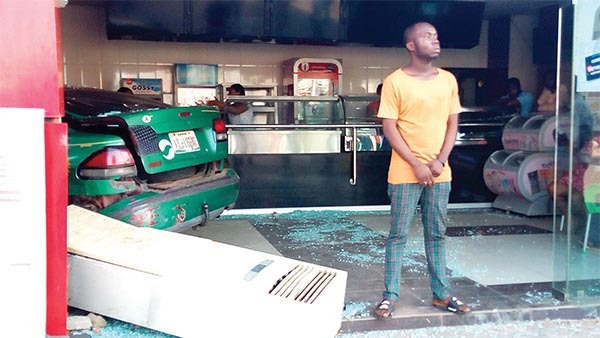 Consequently, the car with registration number ABJ 189 XD ploughed straight into the Mr Bigg's restaurant on Awolowo Way. The accident injured the lady sitting on the passenger's seat of the taxi as well as some staff of the restaurant which was badly damaged.